As of patch 6.1 one, we're seeing Beast Mastery hunters making a strong showing on the DPS meters; some of that due to the strength of our tier set bonuses, but a lot due to the continual buffs to our cooldown Focus Fire. The trouble that we're now encountering, as blizzard seems to be decided on using Focus Fire as the BM tuning nob, is we're more and more reliant on RNG for the best parses. Let's look at a couple of the RNG factors we're relying on: on top of the usual Trinket Procs and Scope Procs, multistrike chances and crit chances, we need to proc frenzy five times, at 40% chance every 3 seconds, and we get a chance to reset the CD on Bestial Wrath once every six seconds (well, it's RPPM, but you get the idea). 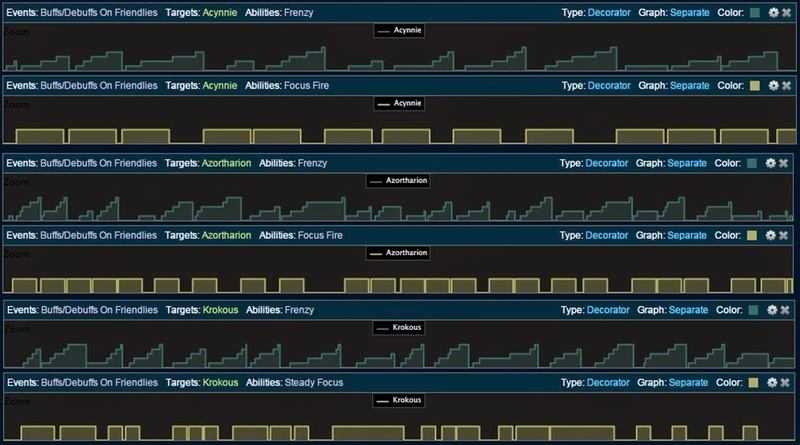 In the picture above, you can see what our Focus Fire buffs might look like with some good RNG. While all of the parses I took these for were top BM parses, and obviously took a tremendous amount of skill, they also required some pretty great RNG. So what I wanted to look at is exactly how good of luck do we need to get, for example, the nearly 80% up-time one of these parses had. A small disclaimer here, the following will have very little to do with actually playing or improving as a Beast Mastery hunter. It will, hopefully, shed some light on the mechanics going on behind the scenes that make BM work. Frenzy -- Your pet has a 40% chance to gain 4% increased attack speed after attacking with a Basic Attack, lasting for 30 seconds and stacking up to 5 times. The mechanics of frenzy are fairly cut and dry: 40% chance to gain a stack. Where we get into more complications is looking at how often it will have the opportunity, however. This is due to one of the Draenor Perks, Enhanced Basic Attacks. Enhanced Basic Attacks -- Your pet's Basic Attacks have a 15% chance to reset the basic attack cooldown and make the next basic attack free. That adds another layer of complication, but shouldn't hurt us too much, since we're only going to be looking at averages/expected values, anyhow. So, let's get started. It's worth noting that there may be even more complication to this, in that our pet's generally don't have enough focus to cast their Basic Attack every 3 seconds, but for now, let's just assume we're taking the Steady Focus talent, in which case our pets will have plenty of focus. In trying to model the situation, let's start with the variable constant, T. T is going to represent how long we have measured in seconds, so we can come up with a formula that can work with any length fight. Without Enhanced Basic Attacks, the maximum number of Frenzy Stacks we can gain is T/3, since our pets will cast a Basic Attack every 3 seconds. To add in EBA (which is what I've decided to call Enhanced Basic Attacks), we need to show that 15% of the time, our pet's Basic Attack happens every 1 second, not every 3. Another way to look at that is to say we should get, on average, 0.148 frenzy stacks (or 4/27 of a frenzy stack) per second. If we're building Frenzy stacks at an average rate of 4/27 per second, we should be expecting to have five frenzy stacks after 33.75 seconds. Note that if that number seems more often than you generally get to cast Focus Fire, it could be because you're not taking Steady Focus, or not getting enough up-time on steady focus; this is, in fact, why Steady Focus is such a great talent for BM. If, just to show a more realistic rotation, you have about 80% up-time on steady focus, you'll be looking at about 1 basic attack every 2.8 seconds on average, which will of course slightly extend how long it takes to build up to five frenzy stacks. Anyhow, back to our ideal numbers, that's roughly 1.7778 Focus Fires per minute, which gives us an up time of just a little less than 60%. To get that up to 80%, instead of 5 Frenzy stacks every 33.75 seconds, we'd need to hit 5 stacks in 25 seconds. Since we average nine and a quarter pet Basic Attacks every 25 seconds, we'd need to get frenzy stacks on about 54% of them. When I look at it that way, it doesn't seem to unreasonable. 14% higher than average RNG (even if this is only one of the several RNG factors in the fight) isn't too much. For funsies, it's also worth looking at what we would need to get 100% up-time on Focus Fire. To get 5 stacks of Frenzy every 20 seconds, we'd need 5/(20/2.7), or ~65.7% of your pet's Basic Attacks to proc Frenzy. Any more than that, and we'll generally just be sitting at 5 stacks longer waiting for the previous Focus Fire to end in order to cast another..
As I mentioned above, this really has very little to do with how we play BM. It doesn't even really help us compare Steady Focus with other abilities. If I were to draw any conclusions though, I would say that the gap between good RNG and bad RNG isn't as huge as one might guess. The key is to play as well as possible every pull, so when you do start to get some decent RNG, it pays off.